14:30-15:30 ساعة "التوقيت الرسمي الهندي"
يهدف نظام المحاسبة المائية إلى تقييم مدى توافر المياه واستخداماتها فى المناطق المختلفة مثل حوض النهر أو منطقة مستجمعات المياه أو مشاريع الرى و ما شابهها. وتبين الدراسات العالمية ان هناك العديد من نظم المحاسبة المائيه المستخدمة، على سبيل المثال: (i ) نظام المحاسبة الذى انشأ فى المعهد العالمى لإدارة المياه (IWMI ) فى عام 1997؛ (ii ) نظام المحاسبة المائية (WA+ ) و الذى يعتبر تطويرا لنظام IWMI (ويم باستيانسن) (iii ) نظام المحاسبة البيئية والاقتصادية للمياه الذي وضعه برنامج الأمم المتحدة للبيئة؛ (iv )نظام المحاسبة المائية الاسترالى بالاضافة لانظمة محاسبة مائية اخرى. علما بان اى نظام منها له مزاياه وعيوبه فيما يتعلق بمتطلبات البيانات ومستوى تفاصيل المخرجات. ومع ذلك، يركز هذا البرنامج التعليمي على الويب على +WA ، حيث تستند المزايا الرئيسية إلى ان البيانات المطلوبة لهذا الاطار هى بيانات عامة و مجانية ، مع متطلبات محدودة للبيانات الأرضية. واستنادا إلى استخدام الأراضي والمياه في المجال المعين، يعمل إطار WA+ على التمييز بين مختلف مجموعات الأراضي والمياه، على سبيل المثال: الأراضي المحمية، الأراضي المستخدمة، و مجموعة المياه المدارة. و تستند طريقة الحساب فى WA+ إلى عدد من الأوراق المحاسبية، مثل: (i ) ورقة قاعدة الموارد ، و التي تمثل إمدادات المياه من مصادرها المختلفة (الأمطار، والري،)؛ (ii ) ورقة التبخر لتقدير استهلاك المياه الفعلي؛ (iii ) ورقة الإنتاجية لتقدير إنتاجية الأراضي والمياه للخدمات الزراعية (كجم / هكتار، أو كغم / م3). ويمكن عرض مخرجات WA+ من خلال مؤشرات بسيطة تسمح بسهولة معرفة حالة إمدادات المياه واستهلاكها وما يرتبط بها من فوائد وتكاليف لمختلف مستخدمي المياه، بما في ذلك النظام البيئي الطبيعي. وقد تم تطبيق نظام WA+ في سياقات مختلفة، على سبيل المثال، على مستوى أحواض الأنهار (النيل، أواش، إنكوماتي، وما إلى ذلك) على المستوى القطري (مصر ولبنان وفيتنام وكمبوديا وغيرها). في نظم الري (على سبيل المثال، دال في السودان، البقاع في لبنان، تادلة في المغرب، البنجاب في باكستان، الخ). ICID, under its policy to extend its knowledge dissemination wider, is initiating Webinar Services for its members in particular and wider irrigation and drainage community in general. This is the Seventh Webinar being given under “ICID Webinar Services”, and first in Arabic to introduce standardized water accounting procedures that quantifies the watershed processes, assesses a safe level of exploitable water volumes and fixes the maximum amount of water that could be withdrawn and consumed by the irrigation sector. Dr.Yasir A. Mohamed is a civil engineer by training and specialised in hydrology and water resources. 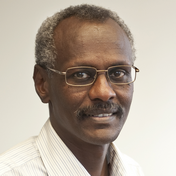 He is presently professor of water resources management and Director General of the Hydraulics Research Centre, HRC-Sudan, and as a joint appointee, he is Associate Professor of water resources management at UNESCO-IHE, The Netherlands. Dr. Yasir joined the International Water Management Institute (IWMI), as a senior researcher at the Addis Ababa Office, where he led different research projects on hydrology and water resources, with emphasis on the Nile Basin. Since 2009, he returned back to HRC, where he became the DG in 2012, and leading research work. As a joint appointee at UNESCO-IHE Since 2006, Yasir has been teaching and contributing to curriculum development with UNESCO-IHE in Delft, and in many other (developing) countries, in particular the Nile basin countries and in Asia. He has supervised many MSc and several PhD students. Yasir has published widely in international journals and conferences. He is a guest editor of the Journal of Physics and Chemistry of the Earth, and Journal of Spatial Hydrology. Dr. Ms. Amani Alfarra a Water Resources Officer in the Land and Water Division at FAO since August 2014. Ms Alfarra is Jordan / Canadian national; has completed her PhD in water resources management titled “Treated Wastewater for Irrigated Agriculture in the Jordan Valley” in 2010 at the Karlsruhe Institute for Technology in Germany. Where she evaluated the water socio –economic using two concepts to increase water productivity and priced water based on its quality and end user. First by evaluating various water allocation scenarios in the Jordan Valley, such as the impact of climate change on water bodies and investigated the willingness of farmers to accept and pay for using treated wastewater. Also she introduced a wastewater reused index. She also possesses in 2004 a Master in Water Resources Management at the ITC faculty under Twente University in Netherlands. From June 2004 to February 2006, she worked as Project Manager, Water Management Expert for an Italian NGO in Gaza, Palestine, to provide technical support for large environmental restoration project. From March 2006 to August 2006 she was Humanitarian Affairs Officer for the United Nations Office for the Coordination of Humanitarian Affairs, mapping and coordinating environmental and water sectors in Gaza strip. From August 2006 to January 2010 she moved to Germany as Hydrology Researcher for the Karlsruhe Institute for Technology to develop hydrological model to evaluate water allocation scenarios impacted by climate change and developed an international wastewater reuse index. Since January 2013, Ms Alfarra is Assistant Professor at the McMaster University in Hamilton, Canada. Prof. Wim Bastiaanssen is the lead developer of Water Accounting Plus (WA+). Through the repository www.wateraccounting.org, Wim produces open access water accounts for river basins, that can be used by all stakeholders involved in the strategic planning of scarce water resources.